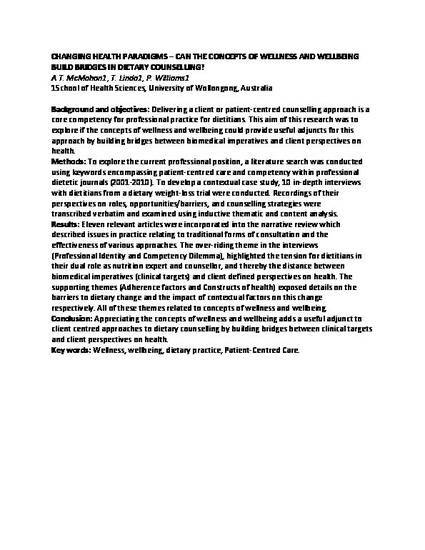 Changing health paradigms - can the concepts of wellness and wellbeing build bridges in dietary counselling? McMahon, A. T., Tapsell, L. & Williams, P. (2013). Changing health paradigms - can the concepts of wellness and wellbeing build bridges in dietary counselling?. Annals of Nutrition and Metabolism: European journal of nutrition, metabolic diseases and dietetics, 63 (Suppl. 1), 1780-1780.